Kruzenshtern Barque: Russian Sailing Ship! The Kruzenshtern dated 1926, from the Bremerhaven, Germany shipyard. She was initially called the Padua. This sailing vessel is still used as a training vessel for Russia. The video tells and shows what it is all about! The Krusenstern or Kruzenshtern (Russian: Барк «Крузенштерн») is a Russian four masted barque and tall ship that was built in 1926 in Bremerhaven-Wesermünde, Germany, as shipyard number “S408” under the name Padua (named after the eponymous Italian city). She was given to the USSR in 1946 as war reparation and renamed after the early 19th century Baltic German explorer in Russian service, Adam Johann Krusenstern (1770-1846). Of the four remaining Flying P-Liners, the Ex-Padua is the only one still in use, mainly for training purposes, with her home ports in Kaliningrad (formerly Königsberg) and Murmansk. After the Sedov, another former German ship, she is the largest traditional sailing vessel still in operation. Originally, like all P-liners, Kruzenshtern was painted according to the colors of the German national flag of the German Empire era, black (hull above water, topsides), white (waterline area) and red (underwater body). The Kruzenshtern led the majestic international procession of tall ships into New York Harbor for Operation Sail on Sunday, July 4, 1976. By the end of the eighteenth century, however, the term barque (sometimes, particularly in the USA, spelled bark) came to refer to any vessel with a particular type of sail-plan. 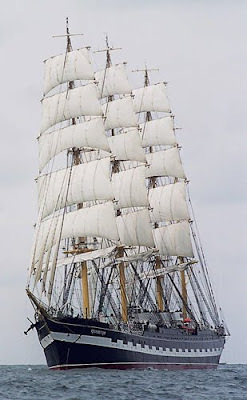 This comprises three (or more) masts, fore-and-aft sails on the after most mast and square sails on all other masts. Barques were the workhorse of the Golden Age of Sail in the mid 19th century as they attained passages that nearly matched full rigged ships but could operate with smaller crews. Any young man training on this craft will have many stories to tell later in life. I would have loved to have been on the crew of this ship (Kruzenshtern) when I was in my youth.